Tupolev I-8 (also known as ANT-13) was an experimental interceptor built in the Soviet Union in the early 1930s. It was the first Soviet aircraft to exceed 300 km/h (162 knots, 186 mph) in level flight. The aircraft was an exercise in developing the Polikarpov I-5 design by a group of engineers led by V. M. Rodionov each of whom volunteered 70 hours of personal time to the project. 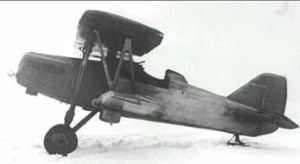 The I-8 first flew on 28 October 1930 with M. M. Gromov at the controls. Despite promising performance, the aircraft did not advance beyond prototype phase because there were no plans to acquire the Curtiss V-1570 engine and no domestic equivalent was available.